Managing the operations of a business requires experience, knowledge, and skill. With the help of our operations manager resume sample and expertly designed writing tips, you’ll be able to prove you’ve got what it takes to get the job done. Follow our guide and you’ll have a resume that will make hiring managers practically beg you to come in for an interview. Or, increase your efficiency with our professional builder and create one in minutes! Not the resume for you? Browse through our all-inclusive list of resume samples to find the one that’s right for you. Want to make sure your resume arrives in style? 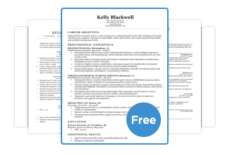 Take a look at our free, downloadable resume templates to for ways to elevate yours. Ready to move on from your resume? Check out our wide-ranging list of cover letters for some helpful pointers. Operations Manager with 12+ years of management experience in manufacturing plants, providing strategic planning and solutions for profitable plant operations, and overseeing daily production activities. Utilized SAP enterprise resource planning (ERP) software to increase efficiency of supply chain management, decreasing costs by 23% and boosting production by 13%. Orchestrated the use of DMAVD Six Sigma methodology to launch 3 new products, which resulted in profits exceeding expectations by 16%. Writing your resume is all about proving that your skills, knowledge and experience make you the best candidate for the job. The following guide will show you some strategies on how best to accomplish this. As an operations manager, you have likely accomplished a great deal over a long career in management. This makes the qualifications summary (or summary of qualifications) the perfect way to start your resume. The unique style of a qualifications summary will catch the eye of the hiring manager as he sifts through a sea of generic applications. Most people tend to use a career objective or professional profile at the beginning of their resumes. The result is a lot of them end up looking very similar. The unique style of a qualifications summary will catch the eye of the hiring manager as he sifts through a sea of generic applications. By putting your greatest accomplishments on display, you provide hard evidence that you have the skills and knowledge necessary to excel. This is something that other resume introductions fall short on. For example, many companies look for operations managers who have experience with enterprise resource planning (ERP) software. In many ways a QS is almost an extension of your work experience. It allows you to overwhelm the hiring manager with a massive list of accomplishments — proving your abilities beyond a doubt. For the most part, operations managers will be working in large enterprises. This means that there is a high chance the companies you apply to are using ATS software to screen applicants. A lot of medium to large-size companies use ATS software to automatically eliminate unqualified candidates. This is because there are far too many applications for HR to personally deal with. However, the software is not perfect, and sometimes even the most qualified applicants can get the robotic axe. A qualifications summary gives you the muscle you need to wrestle down the ATS machine. A qualifications summary enables you to increase the density of keywords and phrases that the ATS scans for. As a result, the ATS will be satisfied you meet the requirements, and your resume will make it into the hiring manager’s hands. Take a look at our comprehensive guide for more details on ATS software, and how to beat it. In your professional experience section, don’t just list your job responsibilities. Hiring managers care less about what you are responsible for, and more about your actual performance. As such, your work experience section should be used as a tool to prove your abilities. More specifically, your ability to use different operations management skills and techniques to accomplish great things. Notice how much more impressive the second example is. If you just state your actions, the hiring manager might say to themselves, “Ok, that’s great. But why should I care?” Answer them with an achievement. The hiring manager wants to know that you are good at using operations management techniques. You can easily prove this by citing what tools you used to get results. After reading this the hiring manager knows you are capable of effectively using Minitab and the Six Sigma DMAIC methodology. By adding numbers, you give the hiring manager a clear idea of exactly how great your accomplishments are. You won’t be able to quantify everything, but you should do it as much as possible. In the unquantified version, “reducing waste” is too vague. The hiring manager has no idea what that actually means — it could even be as low as .001%. By quantifying, the extent of your skill and weight of your accomplishment become clear. Learn more about how to create strong bullet points in our how to write a resume guide! As an operations manager, the diverse range of tasks you perform on a daily, monthly, and yearly basis is immense. This can make it hard to decide exactly what to include on your resume — after all, space is limited. Look at the specific responsibilities, experience, knowledge, and skills outlined in the job description, and highlight them on your resume. This is when the job description for the role you are applying to becomes a powerful ally. Look at the specific responsibilities, experience, knowledge, and skills outlined in the job description, and highlight them on your resume. This will not only help you decide what to include, but will also directly satisfy any specific requirements the hiring manager is looking for. Develop budgets and approve expenditures for supplies, materials and human resources, ensuring that materials, labor and equipment are used efficiently to meet production targets while initiating and coordinating cost control programs. By doing this, you’re able to directly appeal to the hiring manager (not to mention pass through ATS software with flying colors). As a result, you are much more likely to land that interview and get hired. Ready to get started? 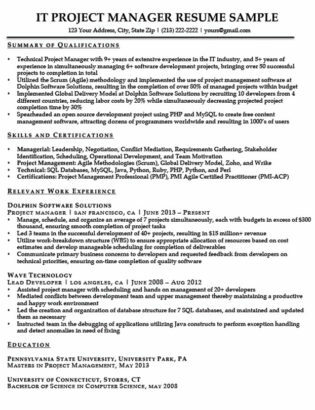 Download the free operations resume sample above, and get cracking! On the other hand, if you’re feeling overwhelmed by the prospect of spending hours writing your resume, get it done in minutes with our resume builder.